This is a esthetic surgical procedure which seeks to correct the appearance of large and / or protruding ears. 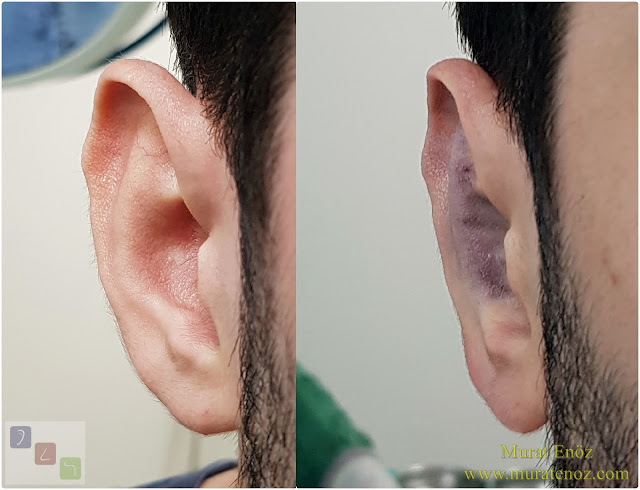 The external ear (pinna / auricle) of living things in nature, unlike the others, plays a small role in human hearing function. You can find the names of anatomical points on pinna at the video above. 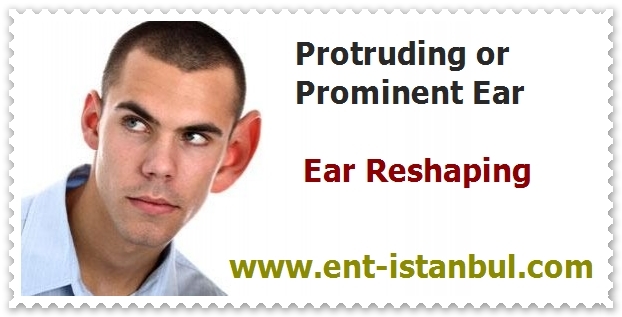 Prominent ear deformity is defined as a be angled outward and obvious meaning earlap deformity. The most common congenital anomalies in the skull and facial area , although there is no consensus on a clear definition in the literature. 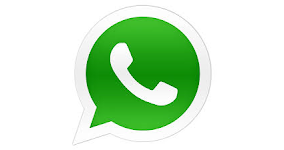 - Antihelikal angle is insufficient. 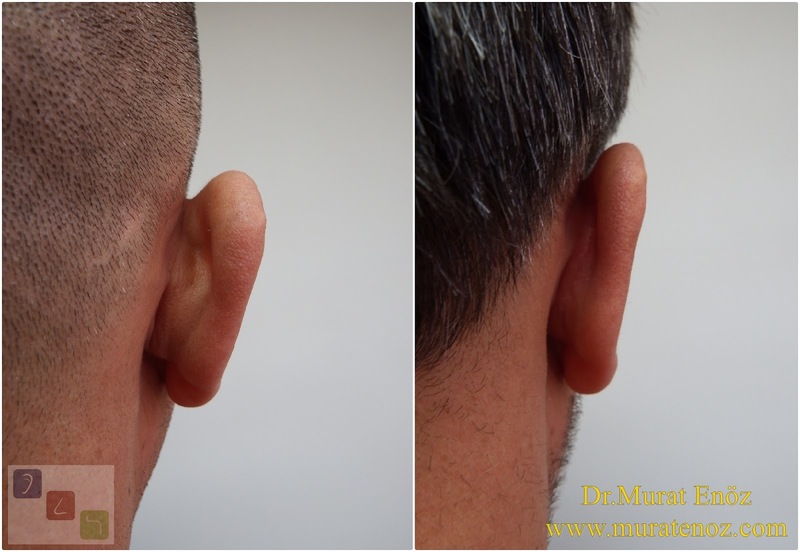 Without sufficient amount of antihelikal fold can cause the pinna position as angled outward. - Conchal cartilage is more than normal. In this way, turning right out of the auricular conchal will be more apparent from the pit . - Conchomastoid angle is more than the normal. 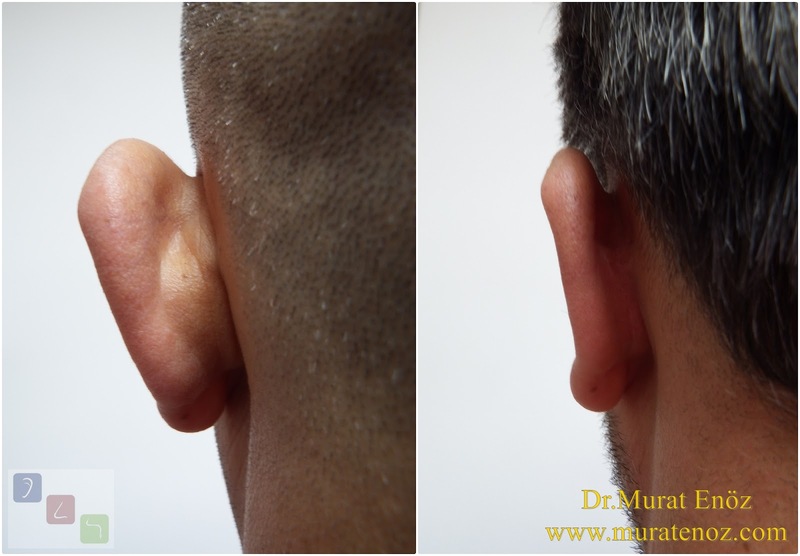 In this way, even if structurally normal auricle will be directed outwardly bucket may become evident. - Further development of earlap (rare). Conchal protrusion together with lack of antihelikal angle are coexisted in 90% of patients. All of these deformities are mostly genetic. Sometimes it can be found with hereditary diseases. 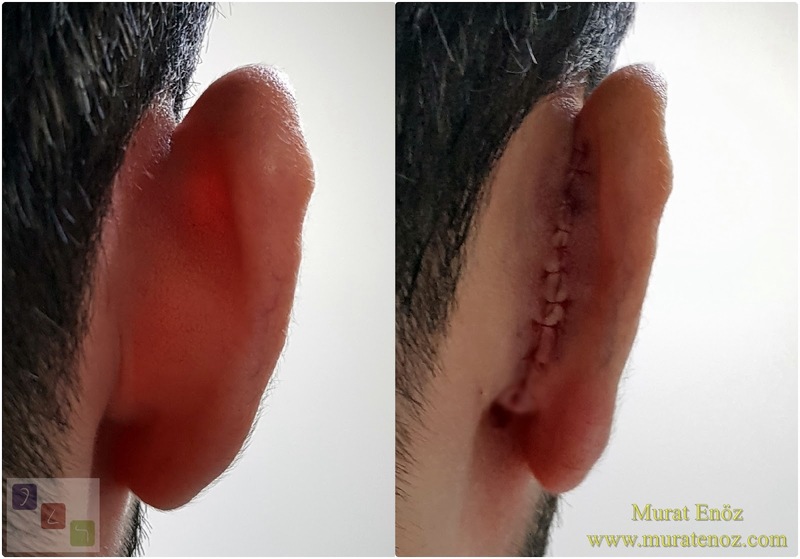 The most well-known suture technique between prominent ear correction surgeries is Mustardé matrix suture technique. - Incision is made behind the pinna, with continued dissection appears to make the back side of the conchal cartilage (At this stage, further processing can be done in the form of removal of the ellipsoid skin island). 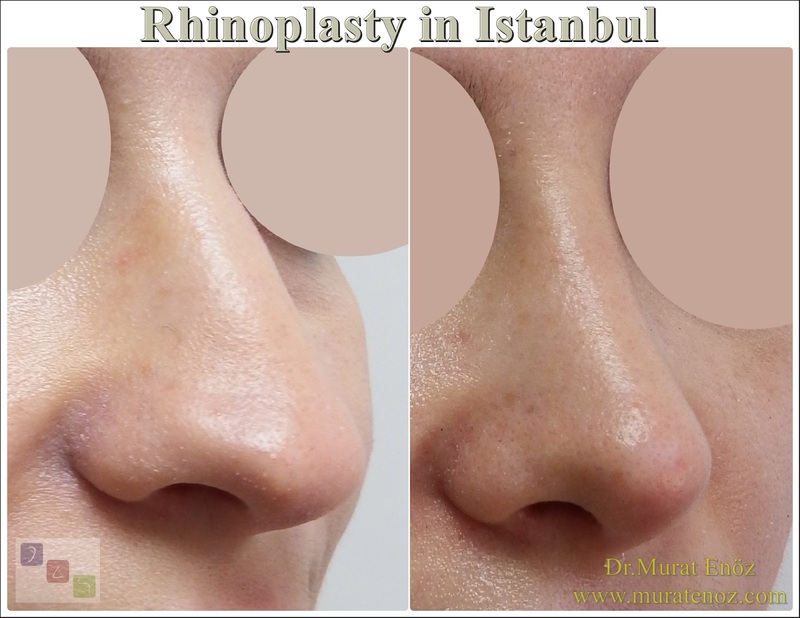 - Skin and subcutaneous sutures are placed and the operation is terminated. This techinque performed especially in excess conchal cartilage, in order to reduce the depth of the conchal bowl and approximate the auricle to the skull. 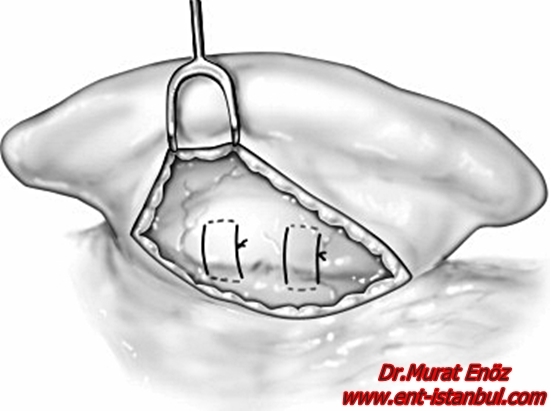 - A double-edged ellipsoid shape additional incision is made on the back of conchal cartilage. 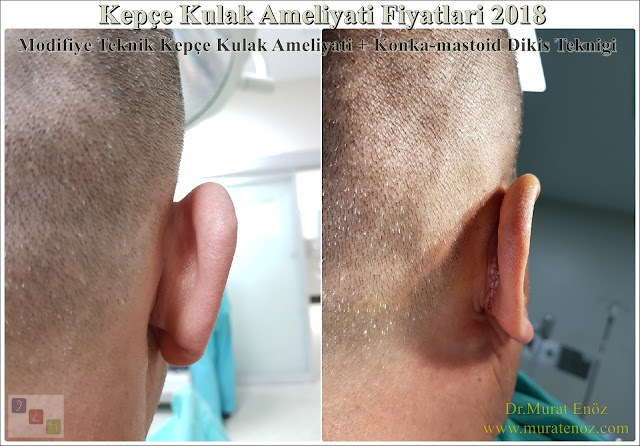 - On the outside of the new cartilage incision, skin is dissected from cartilage on the anteror part elipsoid cartilage area. 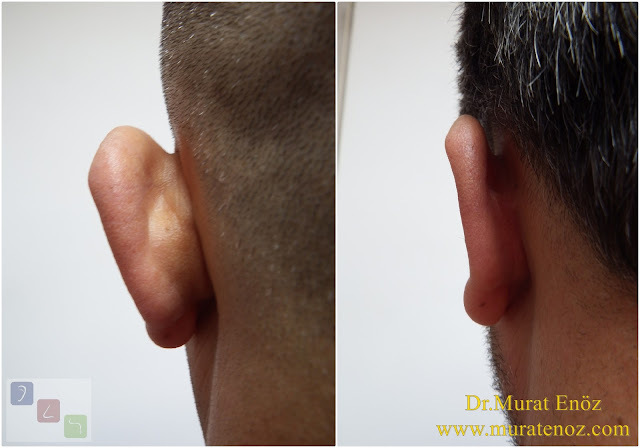 - While ellipsoid cartilage islet become on the anterior, mutual slip provided of surrounding cartilages and sutured. 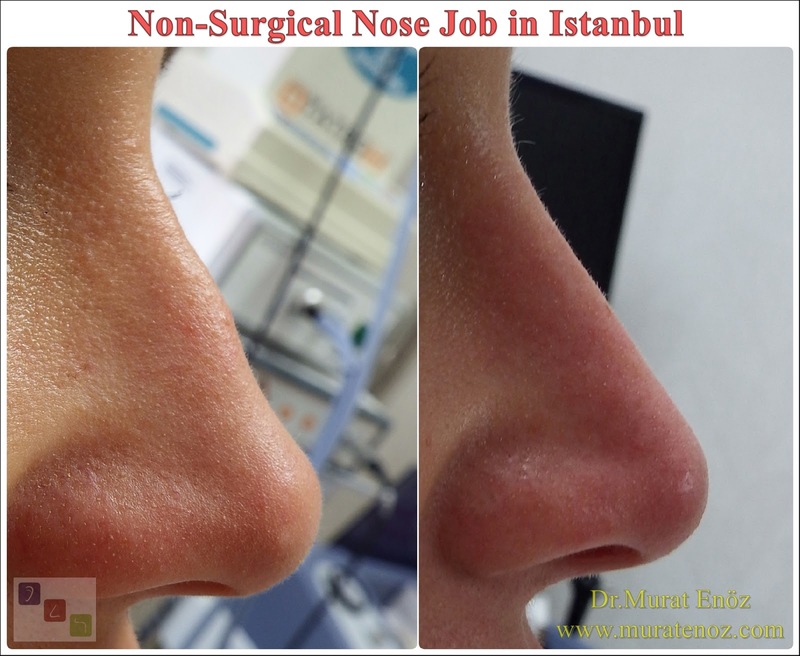 - Skin and subcutaneous sutures placed and operation is terminated. 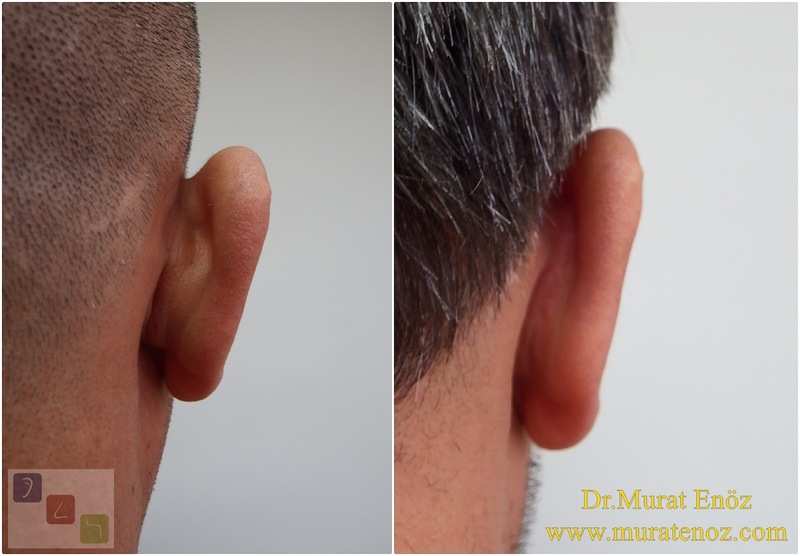 Different techniques that can be modified and defined essentially for each ear. Here is a technique that I wanted to share my favorite. 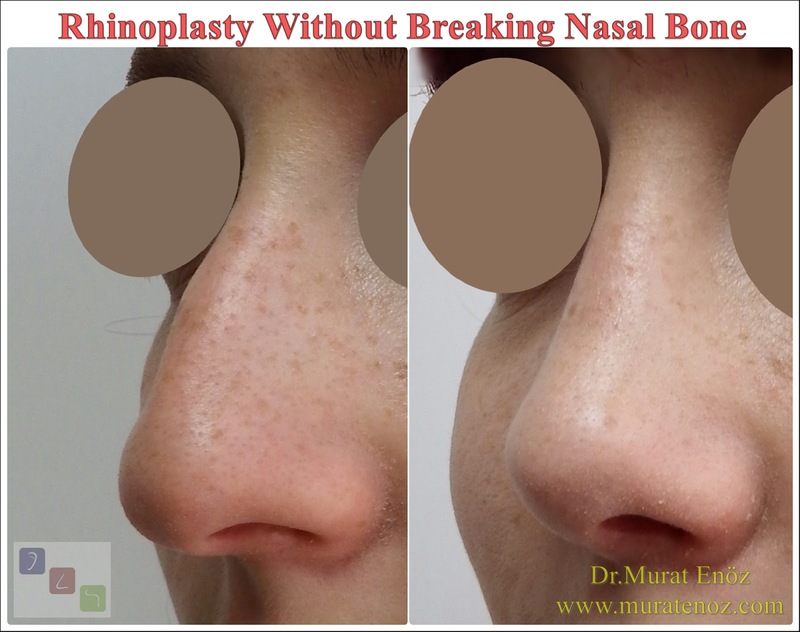 - Incision is made behind the pinna, with continued dissection appears to make the back side of the conchal cartilage. 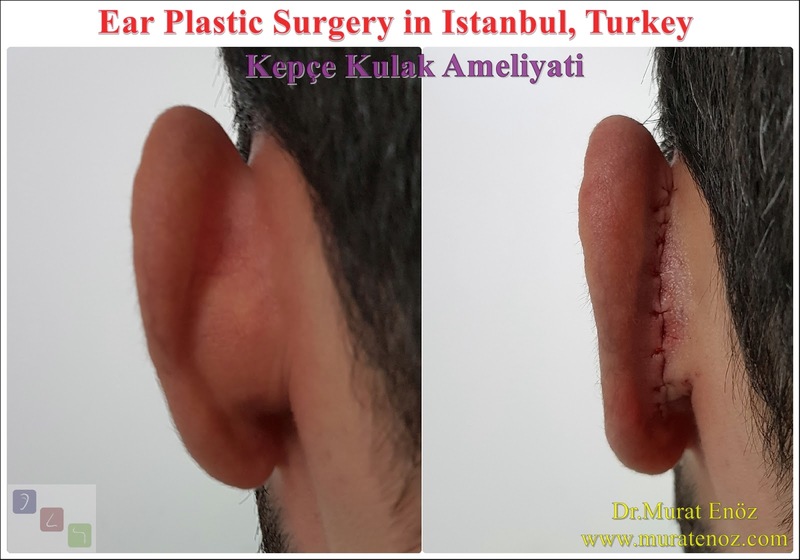 - Re-created in the fold between the fields and the incisions are made on the cartilage inziyon islands separated from the front portion of the skin is dissected edge regions. Using absorbable suture materials are sewn to create folds backwards. In fact, in the form of islands of cartilage ellipsoid can also be created separately. In this technique defined to obtain a natural angle. Permanent suture is not required. 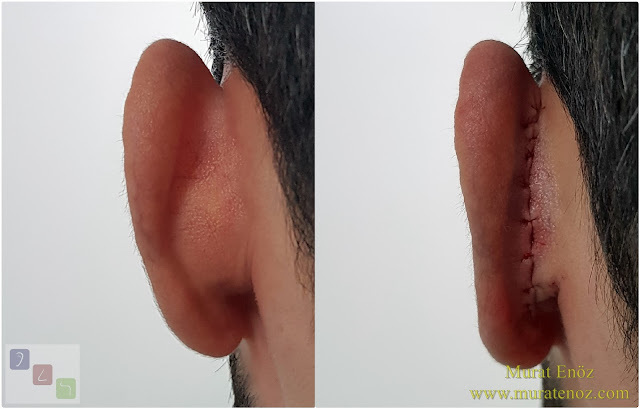 between conchal cartilage with periosteum which located on the mastoid bone behind the ear, pinna is pulled to back and inside side. Apart from that, the cartilage weaken or different techniques are available for the cartilage abrasion. 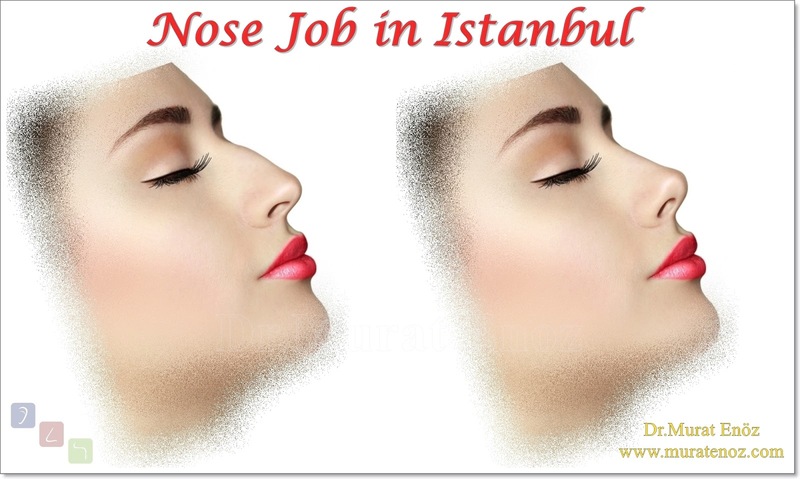 To get the best results, one or a few of these techniques can be applied to each patient by the surgeon. 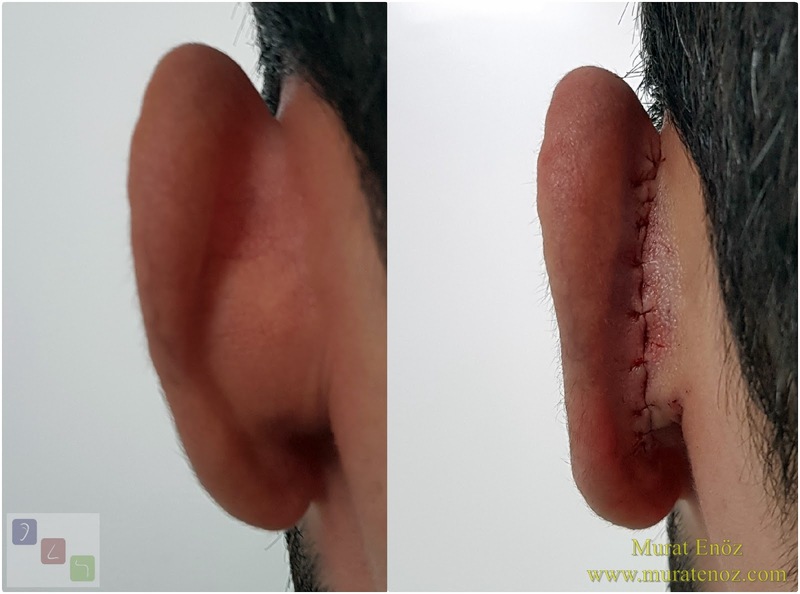 Prominent ear bandage is applied for first 1 week after surgery and using rubber bands, bandanas or a tennis player which give less pressure for the next three weeks is recommended. 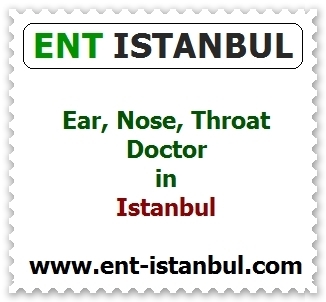 Antibiotics and pain medication are usually given for a period of first one week. - Pain in the ears and feeling the pressure to be due to the bandage. 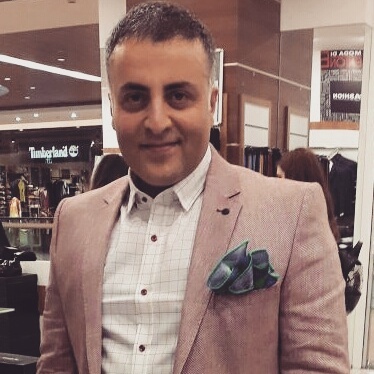 - Edema and erythema on surgical area (usually seen in small amounts) . 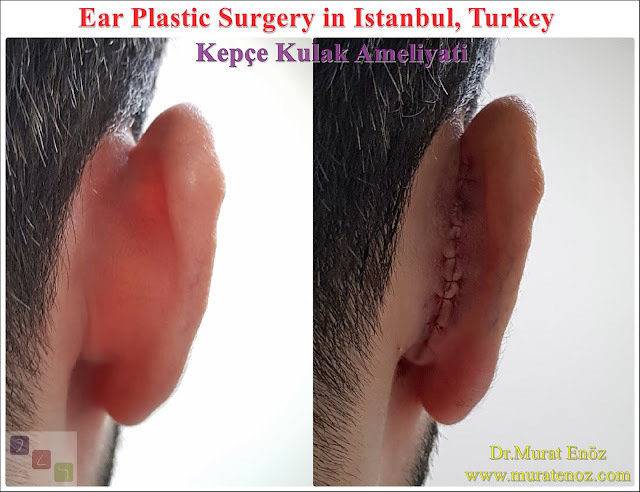 - Incision scar behind the ear auricle can be visibl but usually it is unnoticed by people. 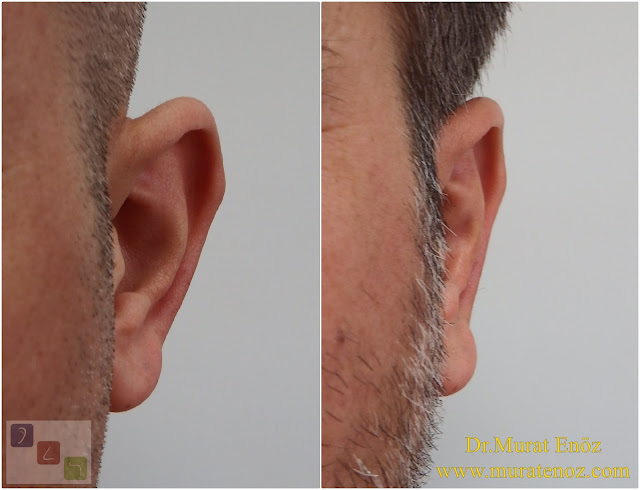 - Numbness around the incision behind the ear (this situation may improve in the months). 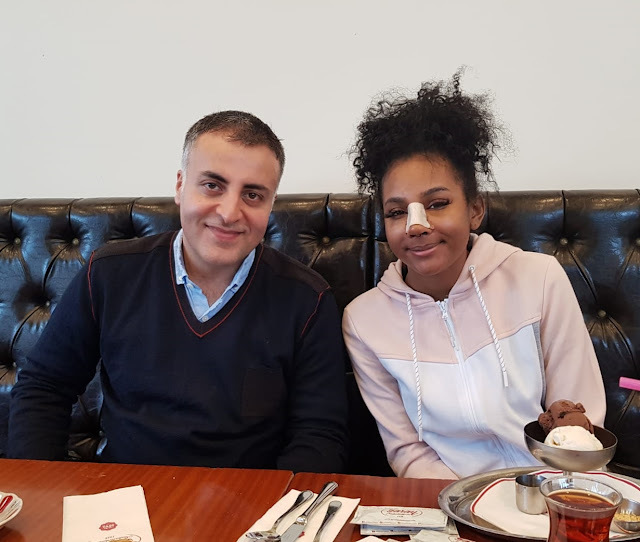 Plaese remember that, shaping and hardening of the tissue after operation occur in a period of 2 months and for the full results and permanent harden up to 12 months . 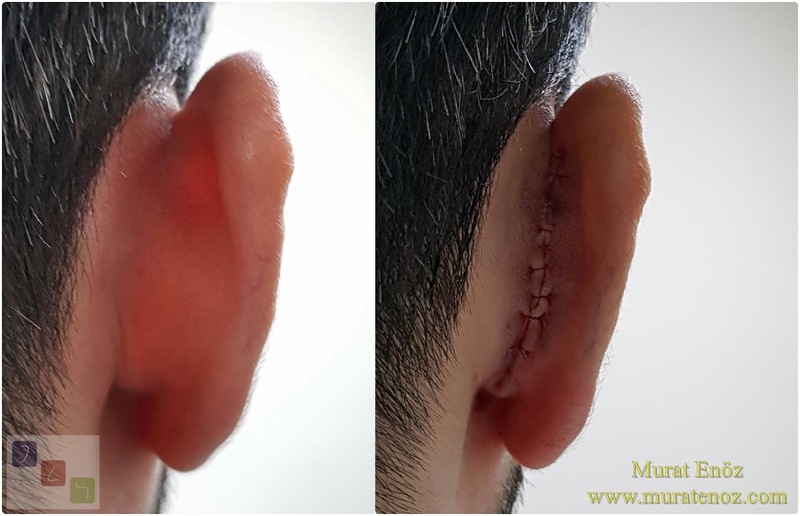 Therefore after surgery, ears plaster wrap or bandage application are used. On the following photographs you can find photos of patients who have undergone prominent ear aesthetic surgery using techniques of "Modified Technique" and "Conchomastoid Technique"